Continuous research and innovations in drug discovery are driving modest growth in the global market for bioengineered protein therapeutics. According to an analysis by BCC Research, other growth factors include more sedentary lifestyles, the rising incidence of chronic illnesses, and an increasing awareness of enzymatic and other disorders. Bioengineered proteins are widely used as therapeutics because of their high potency and reduced side effects. They are created by genetically modifying living cells using recombinant DNA technology. The model organisms for these include Escherichia coli bacteria, yeast, and mammalian cell cultures. Protein drugs can help treat chronic diseases such as asthma, rheumatoid arthritis, cancer, and diabetes. The global market for bioengineered protein drugs is expected to reach $228.4 billion by 2021 from $172.5 billion in 2016, growing at a five-year compound annual growth rate (CAGR) of 5.8%. The United States, which is the largest market, should attain $148.7 billion in 2021, demonstrating a five-year CAGR of 9.7%. The European market could reach $39.5 billion at a CAGR of 0.3% from 2016 through 2021. The emerging markets are predicted to total $40.2 billion in 2021, up from $39.8 billion in 2016, representing a five-year CAGR of 0.2%. A rise in revenues from monoclonal antibodies, peptide hormones, blood products, and therapeutic enzymes has boosted the US market. In Europe, competition from the entry of biosimilars and Brexit (the exiting of Britain from the European Union in 2016) have had adverse effects on the market. The emerging markets have shrunk slightly due to lack of awareness and facilities to market bioengineered products in countries such as India and Brazil. These regions are unfamiliar with protein therapeutics and prefer chemical drugs. Also, many of these products are marketed in a limited number of countries; thus people do not have convenient access to the drugs nor to information about them. The therapeutic use of monoclonal antibodies is expected to increase during BCC Research’s forecast period. Other protein therapies, including some vaccines and therapeutic enzymes, are in demand as the result of the increasing incidence of hormonal disorders, diabetes, and infertility. Increased research and development spending, growing competition, patent expiries, and changing lifestyles are factors shaping the protein therapeutics market. “Global market growth has been favorably affected by the rapid increase in new medical technologies, heightened awareness, the rise in patent approvals, improved diagnosis of diseases, and expansion of healthcare in emerging markets,” says BCC Research analyst Shalini S. Dewan. The Middle East respiratory syndrome (MERS) coronavirus was first identified in 2012. The World Health Organization declared MERS a deadly threat with no known treatment or vaccine. There is still no cure for the virus, and only supportive treatment is offered. However, scientists from the University of Toronto have developed an engineered protein that could potentially be used to treat MERS and other viruses. In PLOS Pathogens, scientists describe how they turned ubiquitin, a staple protein in every cell, into a drug capable of thwarting MERS in cultured human cells. MERS is similar to severe acute respiratory syndrome (SARS), the virus that killed almost 800 people in a global epidemic. Both viruses kill more than 33% of people infected. Like many viruses, MERS works by hijacking the ubiquitin system in human cells. Upon infection, viral enzymes alter ubiquitin pathways in a way that allows the virus to evade the immune system defense. The virus then destroys the host tissue as it multiplies and proliferates in the body. “Viruses have evolved proteins that allow them to hijack host proteins. We can now devise strategies to prevent this from happening”, says Wei Zhang, a postdoctoral scientist at the University of Toronto. BCC Research’s study, Global Markets for Bioengineered Protein Drugs, analyzes proteins that are used for therapeutic purposes, including those in clinical trials. It also examines current and emerging technologies and their impact on the market, the patent landscape, and companies with the greatest breadth in their intellectual property portfolios. 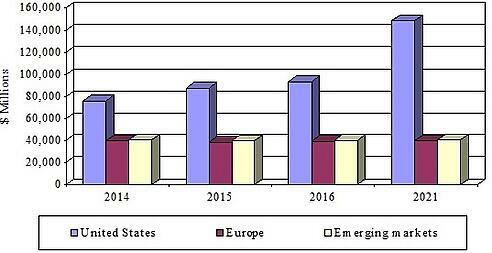 Global market drivers and trends, with projections of CAGRs through 2021, are provided.